Decomposition can have a bad reputation. 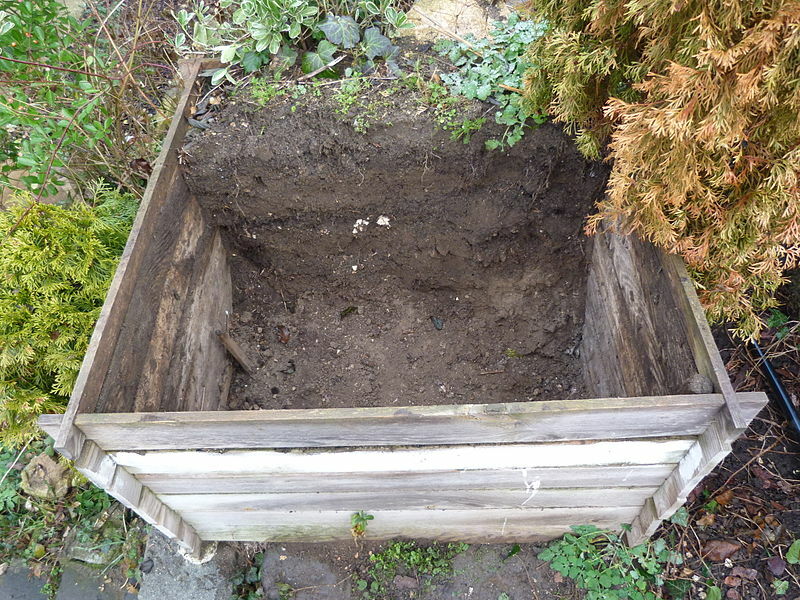 We usually think of something smelly and rotting away, but decomposition is essential for the soil. It breaks down old plant matter to return nutrients to plant, trees, and shrubs. Composting is one way that you can help increase the natural decomposition happening below our feet, and reduce the amount of food waste that goes into your garbage can. This may sound like a smelly job, but composting correctly will convert food waste and plant matter into good compost without producing unwanted odors or attracting unnecessary insects or pests. Home compost barrel in the Escuela Barreales, Santa Cruz, Chile. Source: Wikimedia Commons. 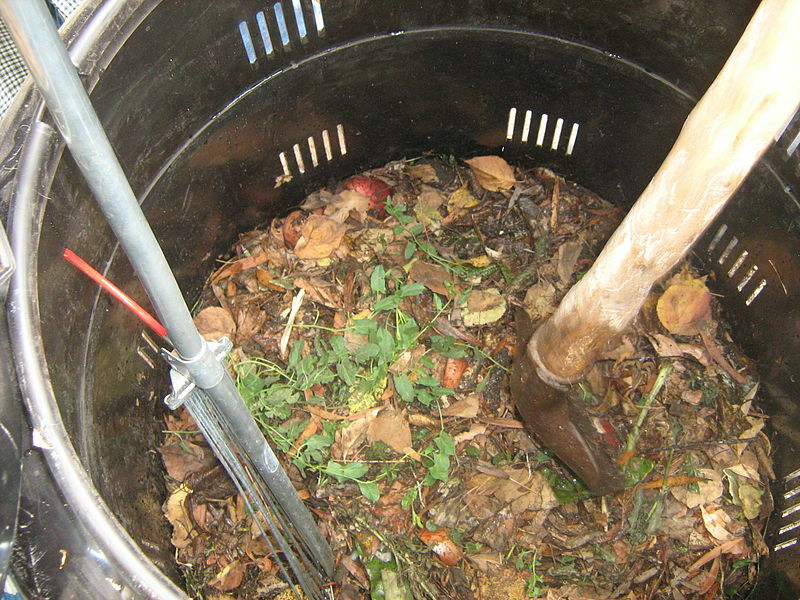 A major part of composting is providing an environment to increase the rate of decomposition. In a compost pile, there are microorganisms that break down the food and return nutrients back into the soil. These microorganisms have a tough job, so they need to have the right conditions to work efficiently. Mostly, we need our compost to have the right amount of moisture, oxygen, nitrogen and carbon. If we do not have these components in the right ratio, our decomposing microbes will not thrive. With the perfect environment, the microbes will get to work. The microbes use the carbon content from the compost pile as a source of energy, and they use the nitrogen to grow, reproduce and to perform protein synthesis. An easy way to make sure that we have that ratio correct is to monitor what goes into the compost pile. Materials that have a high carbon content tend to be brown and dry like fallen leaves or wood chips, and materials that are rich in nitrogen are more likely to be wet and greener like grass trimmings and food waste. It’s important to make sure that you balance what goes into the pile to make sure that your microbes can thrive! If you monitor your compost pile closely, you will be able to tell that the microbes are hard at work because the compost pile will raise in temperature as the microbes decompose the organic materials. 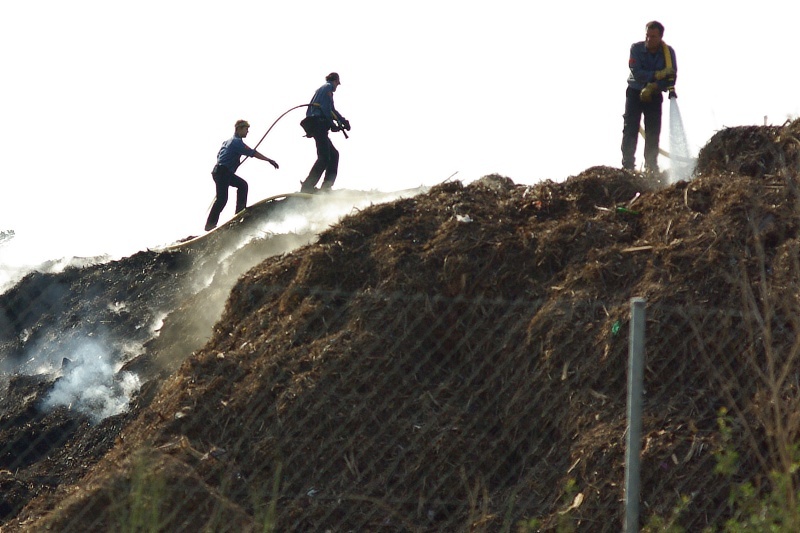 A large compost pile that is steaming with the heat generated by thermophilic microorganisms. Source: Wikimedia Commons. Author: Ramiro Barreiro. The microbes require oxygen to perform at their best, and often they stop performing when the oxygen is limited. In order to introduce more oxygen into the pile and allow the microbes to break down more of the organic material, you should turn the materials in your compost pile. 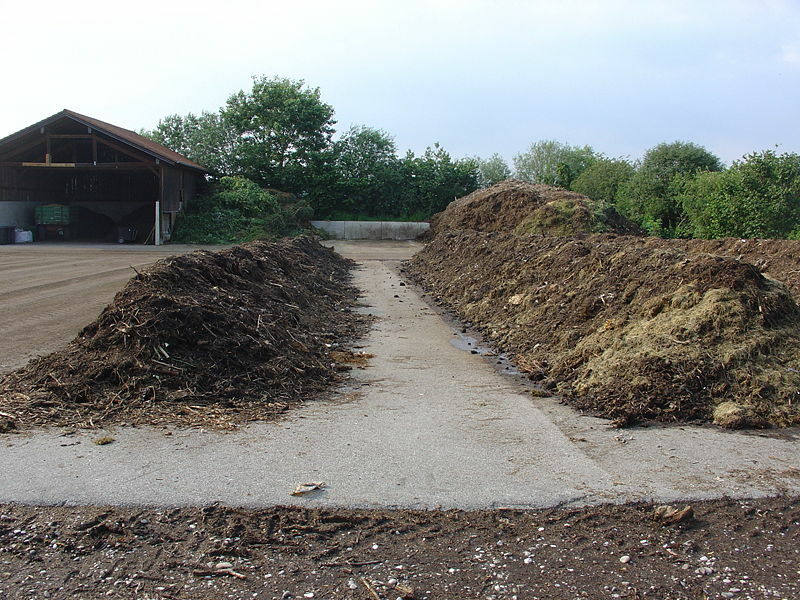 By turning the compost pile regularly, you can increase oxygen content in the pile and thus, increase the rate of decomposition by the microbes. Similarly, you don’t want to over water the compost pile because that can affect the amount of oxygen in the soil. When the oxygen within the pile decreases, the aerobic microbes (our decomposing friends) slow down or die, which allows anaerobic microorganisms to take over. These anaerobic microorganisms require little to no oxygen to function and they are responsible for producing foul odors from your compost pile. In addition to microorganisms, many compost piles will also utilize fungi or macroorganisms like worms to help speed up the decomposition process. Fungi are helpful at breaking down some of the more difficult organic matter like cellulose and lignin, and they often take over the pile in its last stages. Earthworms are aide in the composting process. They digest organic matter and leave behind fertile castings that are rich in plant nutrients. Worms in either compost piles or your own soil are indicators of good microbial activity! There are many different types of composting that can meet your needs. Some types like vermiculture which uses worms are better for small scale composting. It is very efficient and can work well for someone without a yard, but requires a bit more maintenance and it tends to produce a limited amount of compost usually just enough for potted plants. No matter which type of composting that you choose to do, the important part is making sure that the compost pile fits your needs and has the right conditions to flourish. When you are ready to make your compost pile, you want to make sure you have a variety of different types of organic matter like leaves, grass clippings, fruit and vegetable waste, etc. to throw in because this will allow oxygen to move more easily though your pile. If you are concerned about not having enough variety, you can also put cardboard or newspaper into your compost pile providing that it is not covered in harmful ink or glue products. Food waste – after three years. Source: Wikimedia Commons. Author: Derzsi Elekes Andor. Now that we have taken a closer look at the science behind composting, you may wonder what composting can do for you. We know that composting can provide additional nutrients to your soil and help your garden grow. It can also help the soil stay healthier limiting the amount of diseases that can spread to your plants, and increasing the amount of moisture in your soil. By making good compost, you also save on fertilizers because you’ve made your own organic nutrient rich compost. For those of us without a green thumb, composting can also limit the amount of food and yard waste that we are sending to landfills. Instead of sending away those apple cores and bags of leaves, I can use those materials to make my own compost which my garden will love!